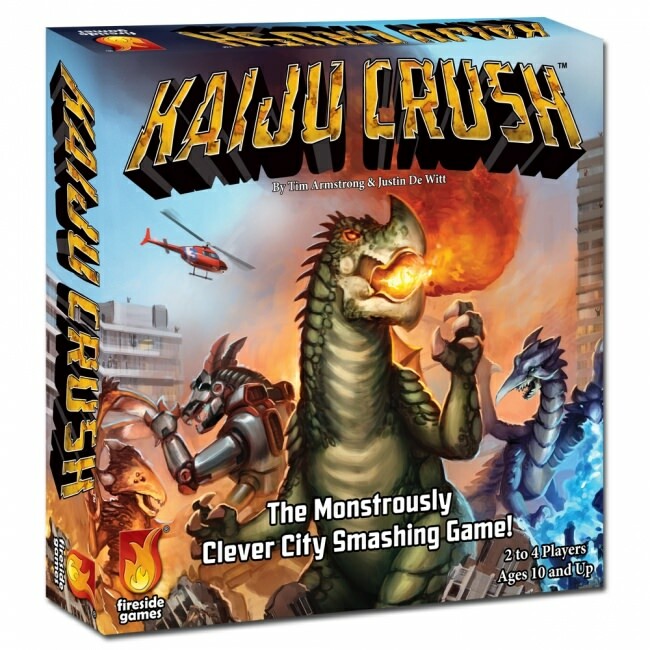 Kaiju Crush is a light strategy game with limited grid movement, shared objectives, and intransitive combat on a modular board. In the game, players choose one of four giant monsters to play and proceed to crush buildings and fight other kaiju for victory points. On each player's turn, they choose to play either their own movement card or the shared movement card to land on and crush a city tile (a.k.a. a building). The player picks up the city tile and drops a territory marker in its place. City tiles score different points and territory markers can yield victory points based on objective cards that show goals like connected or unconnected territory markers, the number of city tile groups a player claims, and shapes created on the city grid. Points are also generated by fighting either a monster on an adjacent space or a monster occupying a territory marker. To fight, players draw five territory markers and look at the reverse side. There are five symbols that represent the blows in the fight: firebreath, claw, tail, kick, and spikes. These symbols are part of an intransitive combat system, in which some symbols beat others but are beaten by others in turn. Each monster also has their own unique fighting ability as well as special abilities that change every game. Winners of either type of battle gain a random combat victory token worth 1-3 points. Winners of territory battles also replace the current territory marker with their own, which may help meet objectives as well as thwart opponents. When no monster can move, the game is over, and the monster with the most victory points is supreme!